Being known as Ha Long Bay within the land, Trang An Landscape Complex is a spectacular view dominated by towering limestone karsts covered with tropical plants and conjoint by emerald rice fields and sapphire rivers. 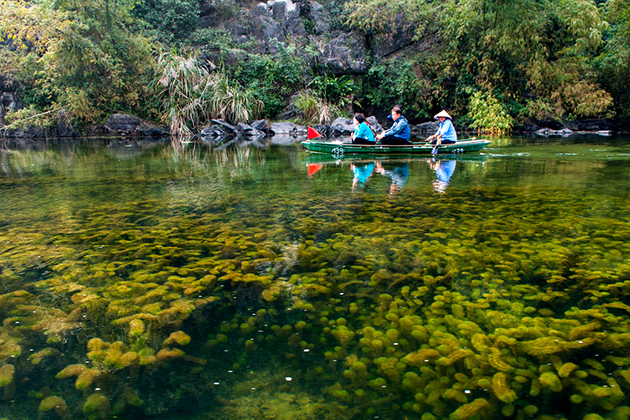 This natural wonder is Vietnam’s only Mixed Cultural and Natural Heritage Site, recognized by UNESCO in 2014. 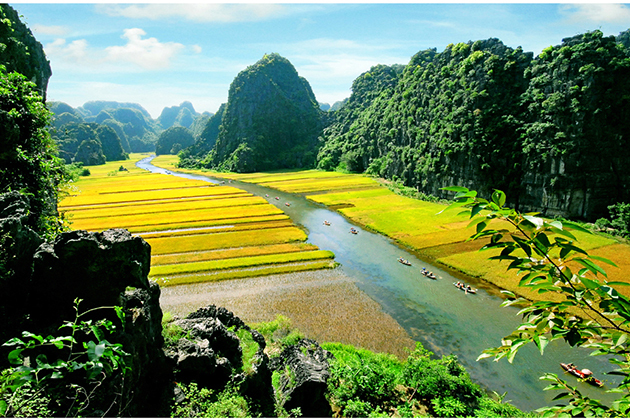 Trang An landscape complex is located near the southern border of the fertile Red River Delta, in the province of Ninh Binh. Tourists can take a bus from Hanoi, in My Dinh or Yen Nghia bus station and travel 90 km southwest. The departure time can be varied within the day, from very early morning to late at night, so there is plenty of time options for travelers. The price for a single ticket is about VND 150.000 (around $7). For those who enjoy the open air and more flexible day trip, a motorbike is also a recommended transportation. Riding from Hanoi, it would take about two hours to get to Trang An landscape complex. The road can be long, but visitors are kept refreshed by the captivating changes of scenery, from bustling cities to peaceful countryside, from the village of houses to inhabited karst mountains and unspoiled lakes and rivers. The price of renting a motorbike is 120,000 VND (about $5) a day. Upon entering Trang An landscape complex, tourists are called for a halt at the entrance gate, where each passenger must be charged VND 150,000 per person for the entrance fee. The fee also includes 2.5 hours of a boat ride on the rivers, in which four passengers will be guided by an experienced local boat rider. 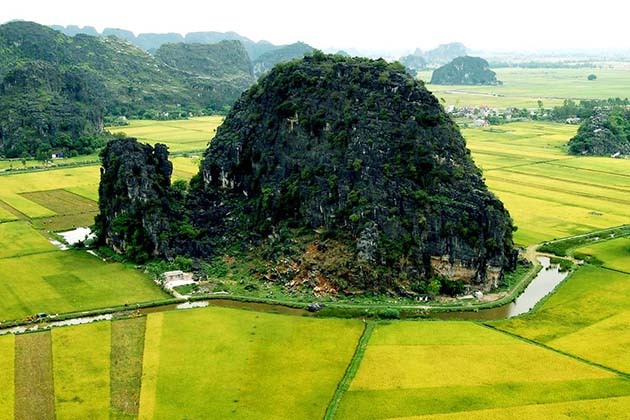 Due to its location near Hanoi, Trang An can be quite crowded in holidays, vacations or festival time. However, coming on normal weekdays, you can have this whole picturesque landscape all for yourself. Embraced in a moist, hot and windy climate pattern, Trang An has developed a system of moss-covered karst peaks and humid hill paths. Due to the need to for easy climbing activities and water boat travel, this destination often has its tour operated in the dry season. However, do not let the inconvenience of a trip under rainy weather get into you, for Trang An landscape complex only appears at its most vivid and lively beauty in the rainy season. Tropical rain paints the immense forests in a fantastic color and the water often becomes so clear it turns to a vibrant hue. 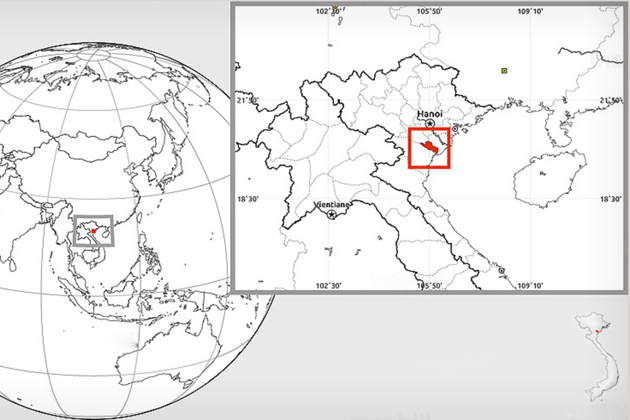 The whole complex of Trang An covers an area of 6,172 ha, surrounded by a buffer zone of 6,268 ha. 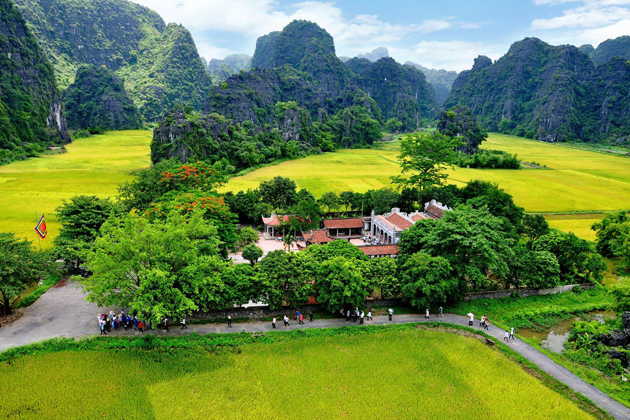 As a Mixed Cultural and Natural Scenic Complex, Trang An consists of four main distinct areas: the historical and cultural area of Hoa Lu Ancient Citadel, the scenic area of Tam Coc – Bich Dong, the ecological area of Trang An and the specially-used primary forest of Hoa Lu. 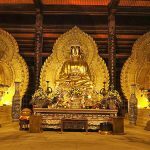 Besides, there are many more other attractive tourist areas in Trang An: Spiritual and cultural areas of Bai Dinh Pagoda, Thung Nham Ecotourism Area – Bird Park, Thung Nung tourist areas, Thien Ha cavern, Mua cave, Old military base Vu Lam, etc. The towering karst mountains in Trang An landscape complex can match Ha Long’s for their grandiose and awe-inspiring sight. In ancient time, this place used to be an imperial city of Vietnam under the Dinh Dynasty. According to Feng Shui masters, some of the limestone shapes resemble the mythical swords and mighty power of the king and his nation – a reason for king Dinh Bo Linh to move his capital to Hoa Lu (Trang An). Some of the karst towers collapse within itself and create such mysterious caves inside, which are accessible for visitors by riverboat. 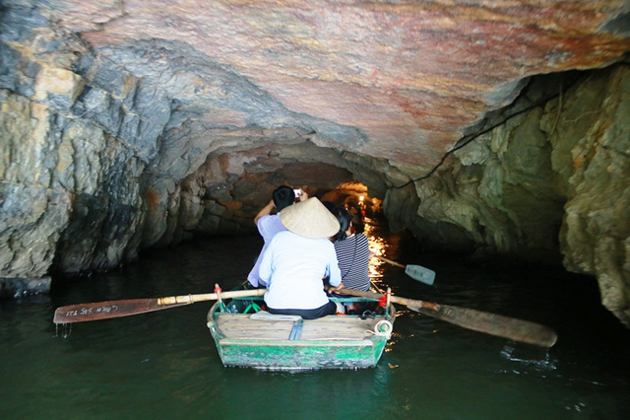 In Trang An landscape complex, there are 31 wetlands connected by 48 caves, including 2 km of water caves, such as Dia Linh cave, Sinh Du cave or May cave. Nothing is more interested than having a boat trip through caves that you can experience the feeling of thrill and admire the strange shapes on the caves when the boat enters the deep grottoes. 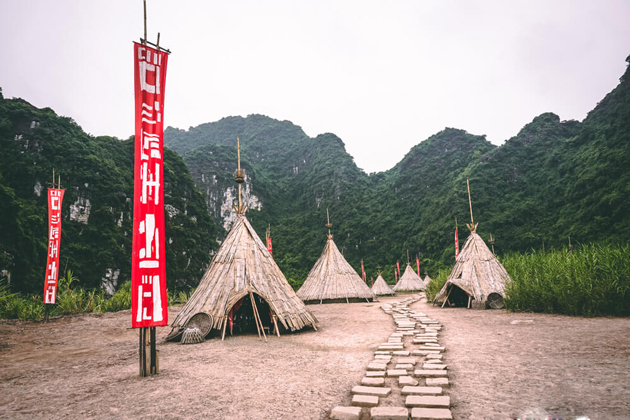 One day visiting Trang An Grottoes, you will be amazed by the unbelievable beauty of Mixed Cultural and Natural Scenic Complex, which is enough for Trang An to become one of the places that anyone should visit once in a lifetime. Immense rain forest, plant and moss cover the landscape, blending with the vast paddy fields below. Rivers cross rivers and rice fields, wrapping themselves around the base of the majestic karst towers. 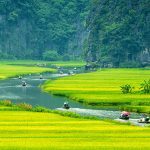 The river system in Trang An is very diverse with the north bordered by Hoang Long River, the east by the Chanh River, the south by the He river and the west by Ben Dang river. Some of the rivers unite in the center of the heritage site, becoming a convenient traveling path for tourists. Trang An is also the land of spirituality and the home of several historic pagodas and temples. The ancient temples and pagodas rest solemnly upon the karst tower’s top or on one of its side, hiding among dark green woods. This is the reason why Trang An landscape complex is most crowded in the first month of the Lunar year when domestic tourists often visit the pagoda to pray for a new year full of fortune. 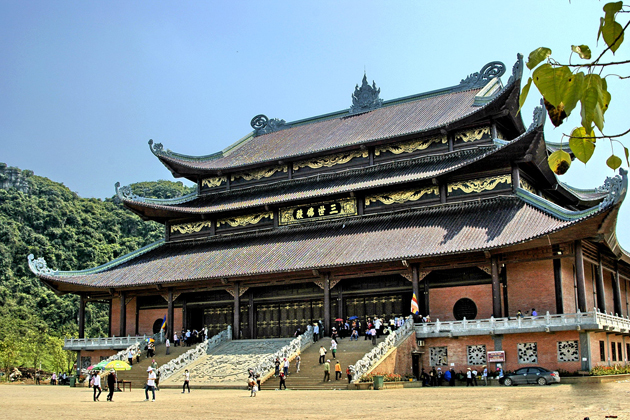 Especially, Bai Dinh pagoda with long-established history and unique architecture will definitely fire your imagination. In April 2017, the Management Board of Trang An has opened the door for visitors to visit the movie set of Kong: Skull Island. In particular, a tribal village in the movie was reconstructed prototype, just like in the movie, which definitely makes a surprise for every visitors in the Kong Skull Island Tours. 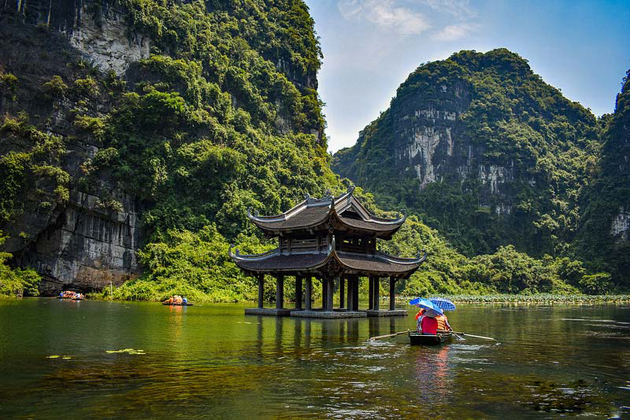 The reconstructed Kong: Skull Island’s film setting is located in the Trang An – Ninh Binh ecological tourist sites, which is also the most interesting place in Trang An – Ninh Binh. The tribal village consists of about 40 huts made of bamboo which are built alternately on both sides, and in the middle is the stone road. Another special thing is that many locals dress up like the aborigines in the movie, from faces to dresses, and sit in huts that make visitors feel like they are living in the movie. We are a group of 4 interested in seeing Trang An complex and the Mau cave view point. Is it possible to do this in one day? and would we be able to see Tam Coc and the Bai Dinh/Hoa Lu? We would need to be picked up in Hanoi. Please give us your recomendations and pricing as soon as possible. Our intended days available for this are some day between April 13 and part of April 16th. Thanks ! Thanks for your attention. 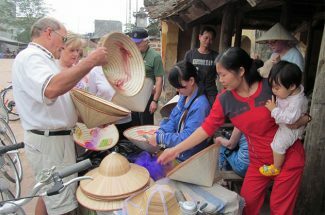 Could you please check our email sent to you so that we can help you create your wonderful Ninh Binh tour.